Transform learning with a COW or Computer on Wheels. This mobile computer workstation allows teachers to integrate technology into curriculum. It’s a computer! It’s a projector! No, it’s a COW!! No, we are not a rural school that has brought livestock into the classroom. Nor have we adopted a barnyard pet. Instead, our school uses a COW or Computer on Wheels to integrate technology into curriculum. Our school is fortunate enough to have two COWs. The primary grades had a contest a while ago and came up with names for our COWs. They are Bug and Matilda. A COW is a mobile computer workstation. 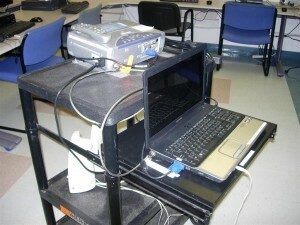 On a wheeled cart is a laptop connected to a projector and speakers. When the laptop is turned on, the image on the computer screen is projected onto a blank wall or projector screen for others to see. The cart can easily be moved to any room in the school. The cart has four shelves. On the top shelf sits the projector with its remote control firmly attached to the unit using Velcro. On the next shelf is the laptop. This shelf is moveable. To use the laptop the shelf slides out permitting the laptop lid to open making it easy to see the screen, type on the keyboard, and attach external devices. When not in use the laptop lid is closed and the shelf pushed back into the cart. Below the moveable shelf rest the speakers and below that another shelf that is useful for transporting additional materials. The laptop has Wi-Fi and quickly connects to the school’s domain. When a teacher or student logs in they are able to see their user profile desktop, retrieve their files, print documents, and use the Internet. In addition, the laptop has several free USB slots and a DVD drive so that media prepared elsewhere can easily be accessed. There is very little training required to use a COW. The teacher just has to plug in the power supply and turn the hardware on. That’s it! As long as there is a power outlet and a blank wall or projector screen, any teacher is ready to use the equipment in less than 5 minutes! How do Teachers use the COW? At our school, it did not take the teachers long to discover ways to enhance learning with the COW. When it was first introduced, the teachers already had an idea of how they wanted to use the technology. They were familiar with using a projector. In the computer lab there is a dedicated teacher computer with a projector that displays an image onto a blank white wall. It is used for almost every lesson in the computer lab. Teachers use it to share resources, model a set of instructions, demonstrate the steps to resolve a common issue, focus discussion, or view student work. Does your School Have a COW? How is a COW used at your school? Share your experiences!